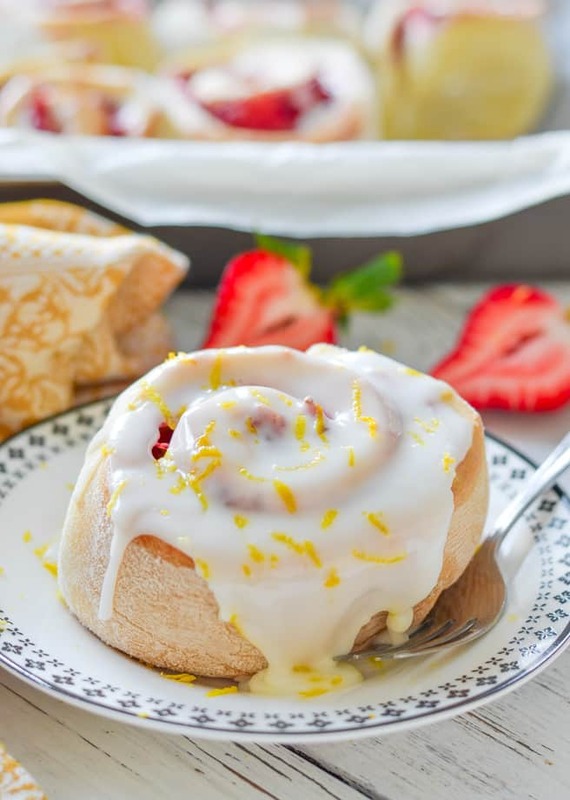 This Sticky Lemon Strawberry Sweet Rolls recipe is easy to make and downright decadent. Soft, fluffy, oozing with sticky, sweet strawberry filling & covered in swathes of zingy lemony frosting. And it’s ready in a little over 1 hour….Grab your rolling pin because it’s time to get baking! Sorry….Not sorry…???? That’s how I feel about this recipe. 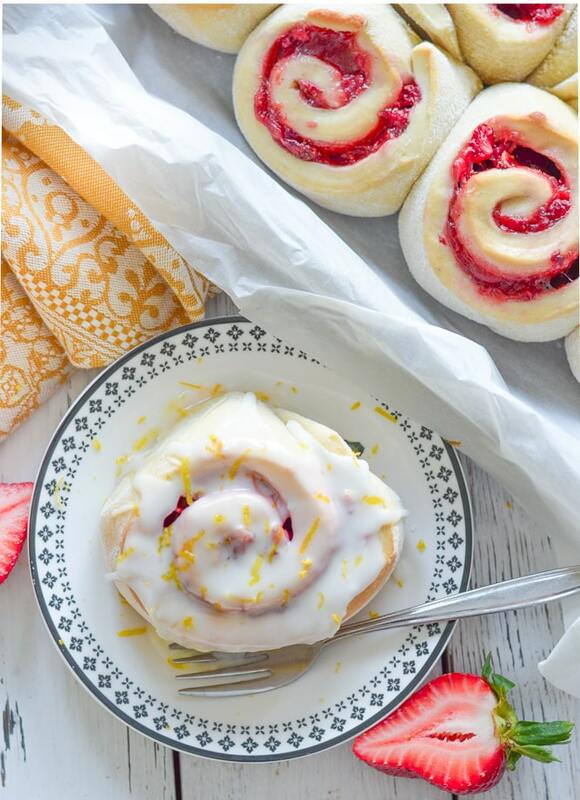 Sorry that I am trying to cut down on the sweet stuff and ended up with multiple pans of these Sticky Lemon Strawberry Sweet Rolls to polish off. Not sorry because they are seriously amazing and of course I take my taste testing very seriously. It would be wrong of me to unleash the recipe on you without eating at least two..um, ok..ten, to make sure they were like completely ok.???? Portion control is not my forte. Perhaps I should have stuck with my Cinnamon Roll in a Mug. That little guy comes ready portion controlled. It’s also been incredibly popular. It’s shot up to take number one most popular recipe on the blog spot. 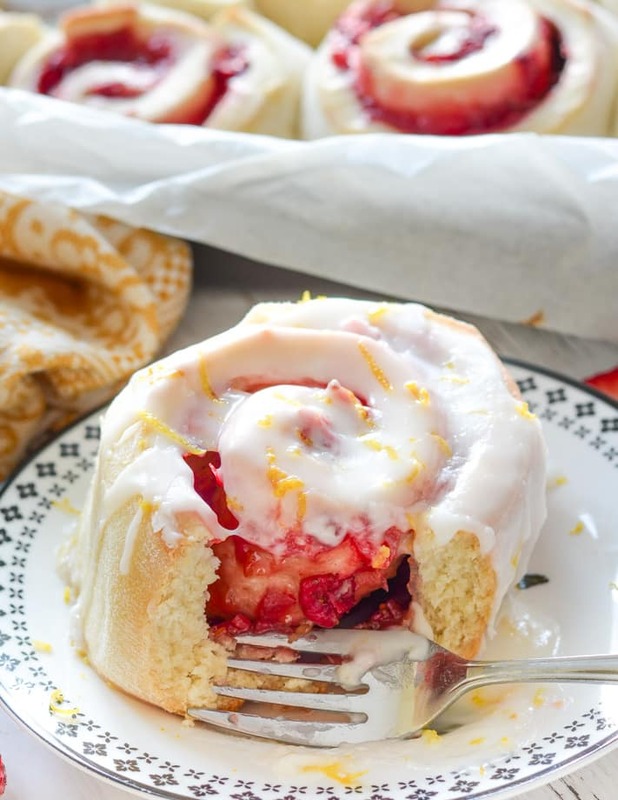 However, as much as I love that recipe, I also love more traditional yeast risen rolls and as it’s summer and strawberries are so glorious right now, I decided to switch up my rolls and make these Sticky Lemon Strawberry Sweet Rolls. The same concept as cinnamon rolls, only no cinnamon. The cinnamon is replaced with sticky, sweet, cooked down strawberries. They are all rolled up in the buttery dough, baked, then covered in swathes of zesty lemon frosting. I swathe, you can drizzle if you prefer. IMHO everything sweet is better in swathes.???? I like my Sweet Rolls to be very slightly crusty on the outside and soft and yielding on the inside. If you prefer yours not so crusty then you can reduce the cooking time a little. Proper instructions are given with the recipe. As for frosting, I know most people like to frost the whole pan of Sweet Rolls while they are warm from the oven. That’s ok if you are eating them right away, but if you aren’t, I find that the frosting kind of disappears and they go a bit wet. I like visible swathes of frosting on mine so if we are not eating them right away, I let them cool then make the frosting later. The frosting is literally just powdered sugar and lemon juice so it’s really quick and easy to stir together right when you want it. I tried these sweet rolls with my vegan butter recipe, Earth Balance Butter and coconut oil. All worked and were good but the best results came from using my butter recipe. The dough turned out really soft with it, probably because of the extra fat from the almonds in the butter. The great thing about it is that you need melted butter for this recipe so you can whip up my butter in 2 minutes flat and just not bother setting it. Use what you need in this recipe right away, then pour the remainder into a little pot and set it in the fridge to use as and when you need it on another day. Freshly baked Sweet Rolls of any kind are just magic when cooked at home. I know working with yeast can be intimidating but these are really pretty easy. I’ve even made a video to show you how to do it step by step. It’s just below. I hope it helps! If you give these Sticky Lemon Strawberry Sweet rolls a try be a ☆ and leave a comment below to let me and other readers, know what you think. You can also share a pic on Instagram. I love to see them! Use the hashtag #avirtualvegan. 200g | 1½ cup fresh strawberries chopped finely , measured after chopping. Don't be tempted to use more. Things will get messy later if you do. Add the strawberries, sugar, arrowroot and lemon zest to a pan and cook down over a medium heat stirring frequently until it is thick and gloopy. It only takes around 5 minutes. Remove from the heat and set aside to cool. Add the flour, yeast, salt and sugar to the bowl of a stand mixer. If you don't have a stand mixer you can mix and knead the dough by hand. Next add the milk, butter (be sure the melted butter has cooled to room temperature) and vanilla. Mix with the dough hook on the speed recommended for bread dough in your mixer. My Kitchen Aid Pro specifies to use setting 2. After a minute or so check to see if you need to add a little extra milk. I usually end up having to add another 2 tablespoons, but it will vary from flour to flour and also depending on the humidity wherever you are. You might need to add a little more. The dough should be soft but not sticky as it needs to be roll-able. If you accidentally add a little too much milk just add a tablespoon or two more flour. Continue kneading in the machine for about another 5 minutes until soft and smooth. If you are kneading by hand you will probably need to keep going for at least 10 minutes. Once smooth and supple, transfer to a greased bowl, cover with a damp towel or cling wrap and leave to rest for about 15 minutes. Once the 15 minutes is up, turn the dough out onto a floured work surface and roll out into about an 9 x 14 inch rectangle. You can stretch the corners out a bit with your hands as you go to help make the rectangle shape or use a pizza cutter to cut it into a perfect rectangle if that's easier. Be sure to add back the bits of dough you cut off into the middle and roll it a bit more to incorporate them and save waste. 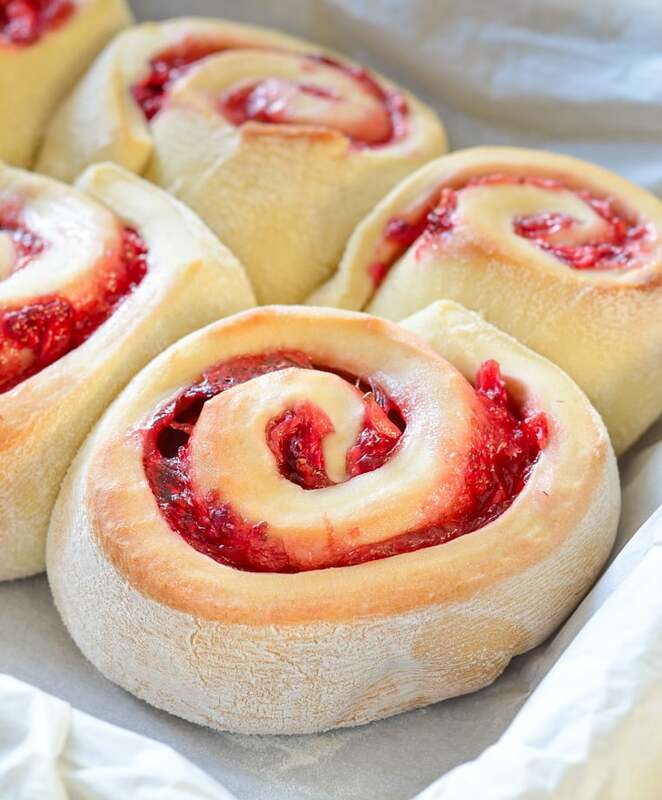 Spread the cooled strawberry filling evenly over the dough then roll up tightly starting along the long edge. Slice the roll up into 8 even pieces. If you want them super neat cut off the uneven ends and discard. I never bother because I don't like to waste it. I find a sharp serrated knife best for this. I believe some people use dental floss. If you do make sure it is a vegan dental floss and isn't flavoured! Place each roll into a greased dish or pan. I lined mine with baking parchment to be sure they didn't stick. I used an 8 x 12 pan but a large pie dish would do or anything similar. Cover with a damp towel or cling wrap again and leave somewhere warm for 30 minutes. If you don't have somewhere warm don't worry, that's fine they will just take longer. Leave until they are just about doubled in size if so. Bake in the preheated oven. After around 22 minutes they should be just about cooked through. If you want them super soft and squidgy remove now. If you want them slightly crusty on the outside they will take around 30 minutes. So basically anytime between 22 and 30. Just keep an eye on them and remove when they are as you like them . Remove from the oven and place the pan on a wire rack and allow to cool a little. You can frost them after about 10 minutes if you want to eat them warm. Or see my recipe note if you will be eating them later. Once frosted a sprinkling of lemon zest is optional but looks really pretty! I tried these sweet rolls with my vegan butter recipe, Earth Balance Butter and coconut oil. All worked and were good but the best results came from using my butter recipe. The great thing about it is that you need melted butter for this recipe so you can whip up my butter in 2 minutes flat and just not bother setting it. Use what you need in this recipe right away, then pour the remainder into a little pot and set it in the fridge to use as and when you need it on another day. I know most people like to frost the whole pan of Sweet Rolls while they are warm from the oven. I think that’s ok if you are eating them right away, but if you aren’t, I find that the frosting kind of disappears and they go a bit wet. I like visible swathes of frosting on mine so if we are not eating them right away, I let them cool then make the frosting later. The frosting is literally just powdered sugar and lemon juice so it’s really quick and easy to stir together right when you want it. 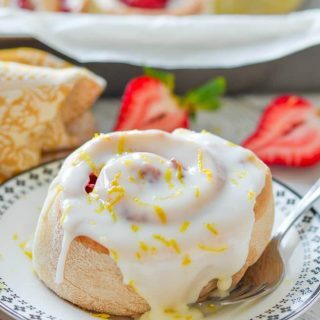 These Sticky Lemon Strawberry Sweet Rolls will keep for 2 - 3 days in an airtight container although they really are best when eaten on the day of baking. They can be reheated in a microwave for 15 - 20 seconds which makes them really soft and almost like freshly baked again. Do you think these would work with homemade strawberry jam as the filling? They would yes, but will be much sweeter. You will need to keep an eye on them while baking too because jam tends to burn easily because of all the sugar in it. If it looks like its colouring too much before they are cooked through, tent them with some silver foil. Hi Mel! Unfortunately I don’t yet have an electronic scale for measuring ingredients, so I have to rely on the less precise cups method–I was wondering, should I be packing the flour into the measuring cup, or just spooning it in and leveling off the top? I know you can sometimes end up with a lot more flour than you might want if the former method is used, but the dough can also be way too wet if you go with the latter. What do you recommend? Thanks so much! If you spoon it in gently then level the top without packing or shaking it down it should work out about right. You’re right that if you scoop it you end up with lots more. I actually plan to write a blog post about it one day as so many people don’t realize and it really affects how recipes turn out. I compared a little while ago and if you spoon it in like I described, you get about 125g and if you scoop it in you get close to 200g. Such a big difference! I hope you enjoy the sweet rolls Kaitlyn! These look DIVINE! Could they be made with gluten free flour, do you think? Thank you! I think it could work but it might be necessary to add some guar gum or xanthan gum to the dough to get a good, fluffy result. You could find a good gluten-free cinnamon roll recipe and just swap out the filling and frosting for mine. That would make sure you had a good result! Thanks for the tip! I’m going to try a Cinnabon gluten free copycat recipe with your filling and frosting! I’ll let you know how it works out! If you don’t have a mixer available can you do it by hand? and if so do you have any tips. Yes you can definitely do it by hand. I only got my mixer last Christmas and always used to before that. Mix the dough ingredients up in a bowl and add the liquid gradually so it doesn’t end up too wet to knead. Mix it up then turn it out onto a surface to knead. I always recommend NOT kneading on a floured surface as too much flour ends up getting incorporated into the dough which kind of puts the recipe measurements out of sync and you end up with a tough, dry dough. I knead just on a clean dry surface with nothing on it, but when beginning, an oiled surface with oiled hands makes it really easy and oil in the dough will only make it a little softer. You can use very mild olive oil or a coconut oil or any other flavourless oil. If you really must use flour make sure it’s only light dusting. You will need to knead the dough for at least 10 minutes, probably up to about 15 minutes until it is really smooth and elastic. If you have never kneaded before this short little video shows a really good technique https://youtu.be/BJiucv88flM . Keep going until it’s really smooth and elastic. When it’s in a ball, if you put your hands either side of it and squeeze in, then let go, it should slowly spring back to position. Once you are at that stage you can carry on with the recipe as written from step 6. Oh wow! I love your Summer twist on the traditional Cinnamon rolls! I can just imagine how fresh and zingy they taste with the addition of strawberries ???? and lemons ???? 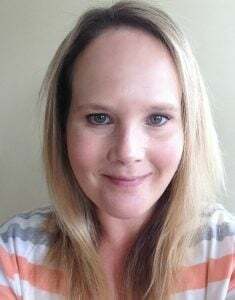 Thank you so much Sharon. I’m glad the video is a help! Now if only I’d been nearby I’d have saved you from yourself and polished a few off myself. These look amazing and I love the combo of strawberries and singly lemon. Fab recipe. Thank you so much Choclette. How heroic of you! ???? These look great, Mel -and so easy too. 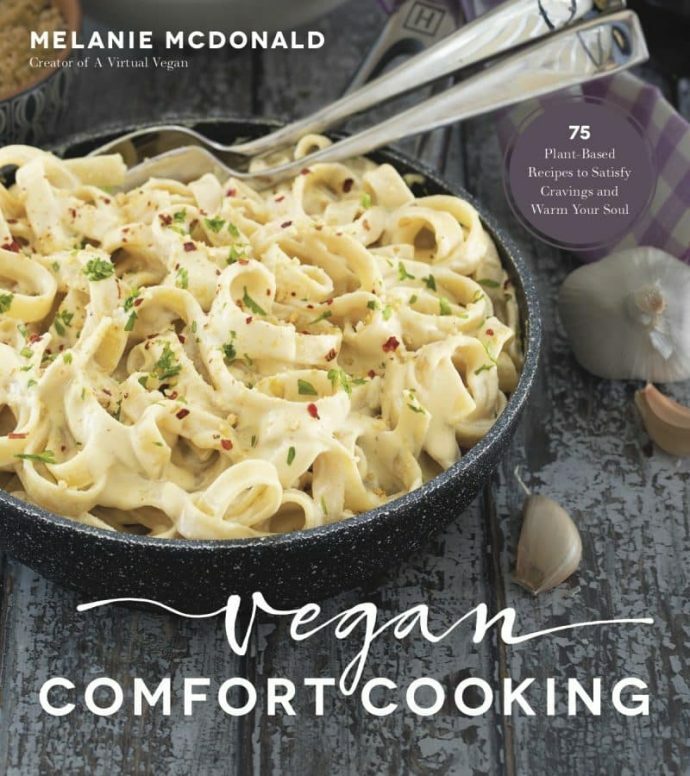 I love your vegan butter, and often use it in recipes, and I adore it on toast! I keep meaning to make some for the blog. 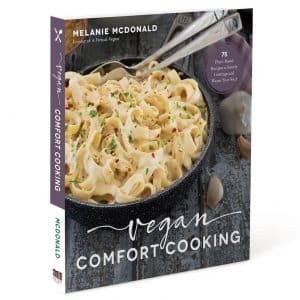 They sell them most places here in Canada and a lot of them are vegan too which is nice when I don’t feel like cooking my own. Oh this recipe looks so satisfying! I am seriously making this tonight after o come back from the gym lol!